Lingacom’s state-of-the-art muon detection system provides security agencies and personnel with efficient and radiation-free solutions for seaports, airports, border control, critical infrastructure, sensitive locations, and nuclear and radioactive sites. 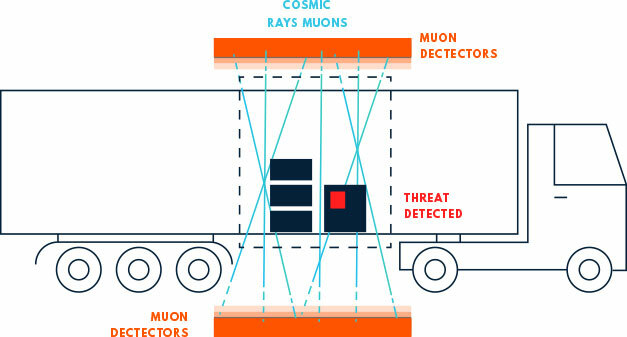 The muon detection system interfaces with the existing inspection systems PRM (Portal Radiation Monitor) and X-ray scanners. Lingacom develops and fabricates unique muon detectors based on ionization and electron multiplication in gas. The technology has key advantages: supports high spatial resolution, sealed mode operation, and has a simple PCB-based production process with a safe and chemically stable gas mixture. Green, passive, and safe detection that can be easily deployed, with in-house 3D imaging algorithms and a complementary concept of operation with existing deployed inspection systems, including X-ray scanners and RPM (radiation portal monitors). Enhanced detection of high-Z materials such as heavily shielded nuclear or radioactive materials hidden in dense containers and vehicles settings. Powerful detection algorithms for mid-to-high attenuating cargos. Lingacom provides its customers with business models that are based on OEM white labeling including customization, marketing, and technical support for worldwide deployment.